Whether you're trying to design your office interior with a consistent visual solution, a trade show booth or promote a sale, Kickass Corporate is your inside track to visible and effective indoor displays. 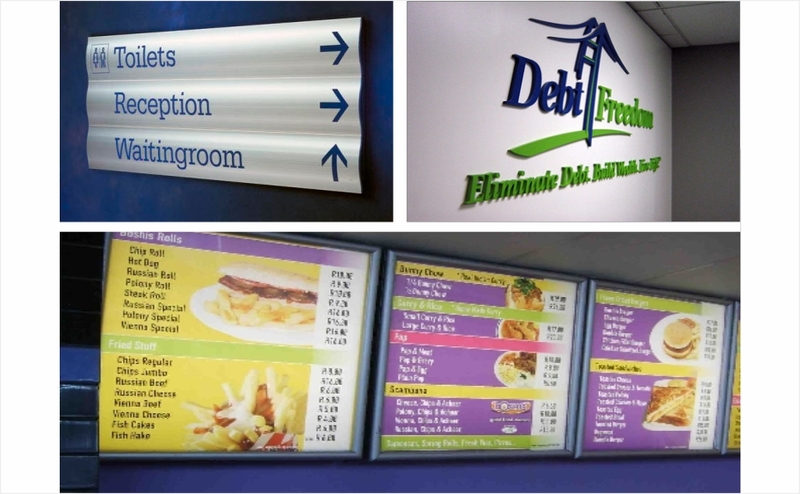 Indoor signs can include health and safety signs, information boards, reception branding, corporate images in meeting or conference rooms, posters, window displays, promotional signage, canvas, acrylic blocks, wall vinyl and point of sale graphics. Our indoor sign-making capabilities include dimensional company, office and lobby signs and logos, engraved signs, ADA-compliant sign systems, menu boards, point-of purchase displays, directory signs, trade show booths, banner stands, presentation displays and meeting signage. As specialists in corporate office signs and all types of indoor signage, our sign solutions make a valuable impression on your visitors, while also making it easier for employees to simplifying business operations at larger facilities. Indoor signage that is properly designed and located will also instill a subtle sense of comfort and confidence in your employees, clients, or guests. And most of all, our indoor sign graphics can transform a plain corporate environment into a sophisticated, elegant, fun and welcoming environment that staff members, clients, and visitors will look forward to walking into! Once customers are inside your building, their overall experience is affected by the quality of your visual messaging presentation and depending on the size of the building, how easy it is to find their destination. Our indoor sign solutions blend your décor with an effective series of available signage systems including: ADA Signage, Awards & Plaques, POP Displays, Office Signage, Reception Area Signage, Suite Signs and Directional & Wayfinding Signs. Create visual impact with colorful printed posters. Great for any industry, custom printed posters. Communicate information for any business, service, or organization. Mounted, framed or displayed in a stand, posters incorporate logos and colorful digital graphics to capture attention in a low-cost, effective way.